“It is important that young people know the results of the two wars of the last century. It is a negative treasure but a treasure (nonetheless) that should be passed on to create awareness,” the pope said Oct. 23. “Pope Francis contributes as a fellow elder, offering the preface and his own story in each chapter, while also reflecting on dozens of others’ stories,” according to the book’s website. 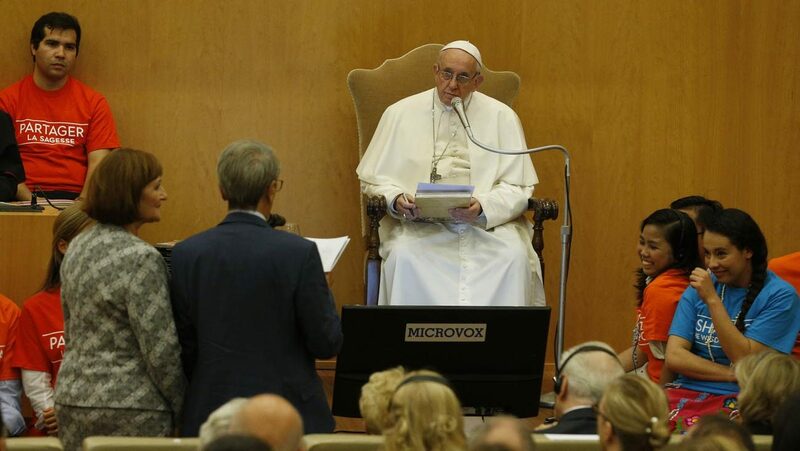 During the event, titled “Wisdom of Time: An Intergenerational Conversation with Pope Francis,” the pope took questions from both elderly and young people on issues ranging from the crisis of faith that exists in the world to the plight of migrants and the suffering of humanity. “How can we elderly people strengthen and guide the young and what they have to go through in life? How can the faith of a young woman or man survive in this maelstrom? How can we help the church in this endeavor?” Scorsese asked the pope. The elderly must teach young people that “cruelty is the wrong path” by passing on “the wisdom of weeping; the gift of crying,” the pope said. By listening to those experiences, he said, “we understood what a war was, which we didn’t know” in Argentina. Elderly people who have lived through war must pass on their experiences to today’s generation, who are living through “a third world war fought in pieces,” the pope said. Hatred is a path of “destruction, of suicide” that is often disguised with seemingly just reasons. For example, the pope said, Hitler “covered it up with maintaining the purity of the race,” which is the same reason being used today to justify refusing to help migrants and refugees.